Like many marketers, I have a bit of experience with Microsoft Excel. I’ve used it to organize events, plan meals, and sort data — but I don’t have nearly the advanced knowledge I wish I did. And thanks to those limited skills, I’m constantly subjecting myself to the tedium of updating my spreadsheets manually. Like me, you’re missing out on a world of Excel training courses that could teach me how to automate my reports and save hours of time. When I asked even my most Excel-savvy colleagues where they picked up their knowledge, they told me things like, “I mostly learned from colleagues and friends,” or, “When I have a specific question, I ask someone or search on Google.” Fair enough. But as a beginner, I probably have a few too many Excel questions to rely on colleagues — or Google — to answer every one. I can’t be the only one out there who wants to master the world’s most popular data analysis and visualization solution — or at least learn how to create charts and graphs that’ll impress my manager. Create PivotTables to find relationships between data. Enter formulas across cells, rows, and columns. Conduct a VLOOKUP across an entire column. Run accounting functions to track business finances. Group, ungroup, and reformat rows and columns. Perform data validation to control the format of cell values. Use keyboard shortcuts to make quick changes to cell values. Create charts from your spreadsheet data. Develop histograms of data from the charts you create. Create dashboards to manage multiple groups of performance data. Add conditional formatting to rows and columns that fit certain criteria. Print your Excel spreadsheet for presenting to others. Take a look at the free and paid resources below. Bookmark your favorites and get that much closer to working more efficiently in Excel. When it comes to learning a new application, why not start at the source? After all, no one knows Excel better than the people at Microsoft. In fact, they’ve done a great job putting together the Office Training Center: A resource hub for all Microsoft Office applications and services. The training center for Excel has a whole bunch of free tutorials, videos, and guides on Windows, Mac OS, Android, iOS, and Windows Phone that cover the latest version of Excel, as well as older ones. 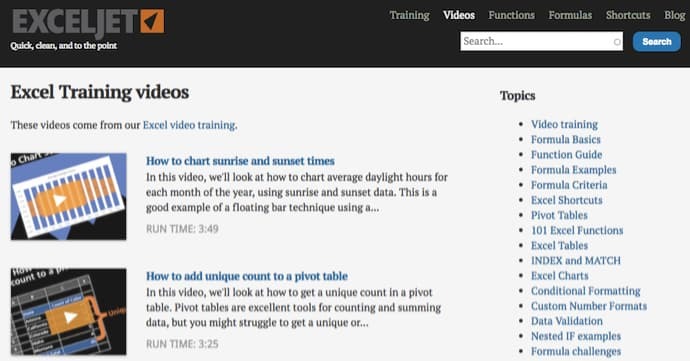 Once you click into a platform, you’ll find resources divided by Excel ability: For beginners (like basic math and creating a chart), intermediate users (like sorting and filtering data, conditional formatting, and VLOOKUPs), and advanced users (like pivot tables, advanced IF functions, and how to password-protect worksheets and workbooks). 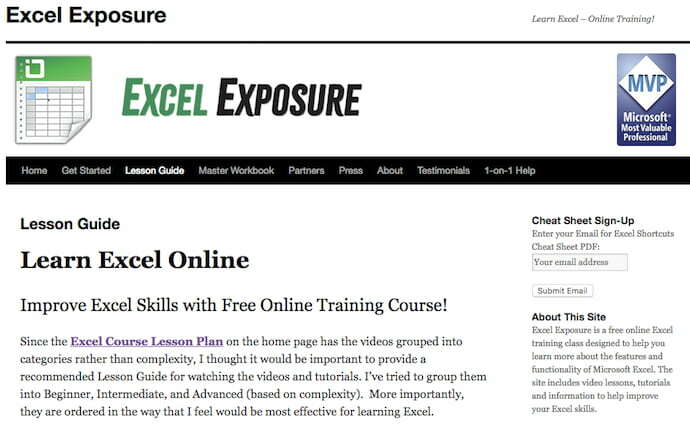 Excel Exposure is a free series of written and video-based courses to help you learn Excel regardless of your skill level. There are nearly 40 lessons — split into “Beginner,” “Intermediate,” and “Advanced” — each no more than 20 minutes long. In addition to this a-la-carte curriculum, Excel Exposure offers a “Master Workbook” that lives directly in Excel to help you practice what you learn in each lesson. Learnings include data and time functions, how to group and ungroup rows and columns, using conditional formatting, PivotTables, chart design, and more. Seeing as Excel is one of the most in-demand skills for data-driven marketers — and because we want marketers like you to succeed — we’ve created some of our own educational content about Excel here at HubSpot. 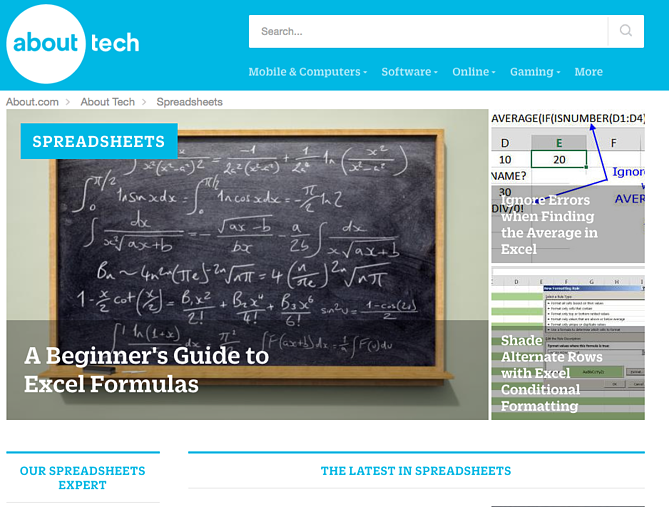 From free ebooks, to templates, to video tutorials, we aim to cover a wide range of Excel-relevant topics. 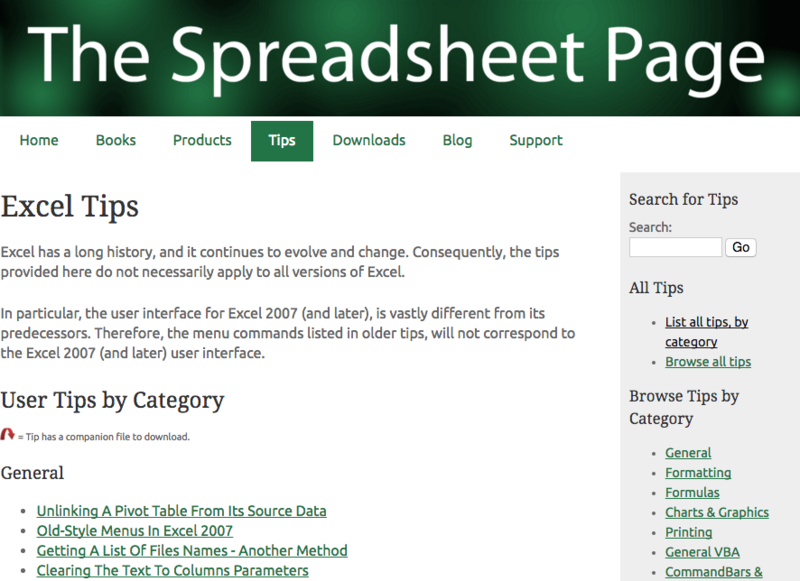 Here’s a very well-organized site that’s chock full of helpful Excel tips, collected by an expert named John Walkenbach. Over the past 30 years, he’s written more than 60 Excel books for users of all levels, and around 300 articles and reviews for magazines like InfoWorld, PC World, and PC/Computing. At one point, he wrote the monthly spreadsheet column for PC World. In other words, the man knows his stuff — and he knows how to present it. The most helpful part of his website is probably the Excel Tips tab, which has a long list of useful pointers on formatting, formulas, charts and graphics, and printing. The tips themselves include everything from working with fractions, to unlinking a pivot table from its source data, to spreadsheet protection FAQs. The Downloads tab is another particularly helpful section of Walkenbach’s site, where he’s added free, ungated download links to files he created, like free Excel workbooks and add-ins. For example, there’s one Excel workbook available for download that gives examples of custom number formats, which you can play with and tweak on your own time, and get familiar with them without having to start from scratch. Many of you are likely familiar with the content website About.com, but did you know it has its own spreadsheets subdomain — much of which is devoted to Excel? There are likely thousands of instruction sets on that site, most of which are illustrated, how-to posts. Plus, fresh content is added regularly. Each piece of content is categorized according to everything from formulas and formatting, to videos, tools, and templates. If you want to stay up-to-date on the latest spreadsheet news and tips, you can sign up for a free newsletter. There’s just one caveat: the site contains a good amount of ads — but if you can stand them, the content is worth it. 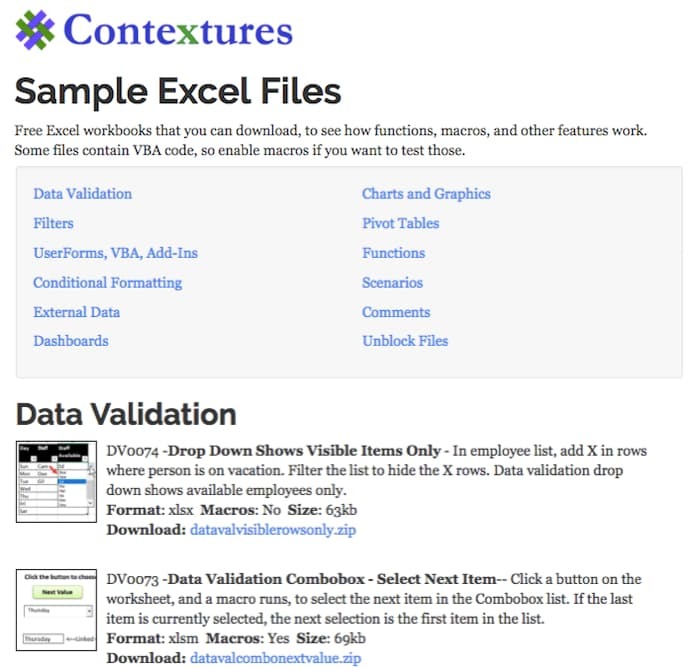 Contextures is a place for free Excel instructions in the form of quick tips, blog posts, a newsletter, and even .zip files you can download to see how various functions work in the context of real tables of data. This resource has literally hundreds of downloadable spreadsheets that open in Excel and offer step-by-step instructions for performing data validation, adding filters to rows and columns, adding conditional formatting to rows and columns, designing charts, creating PivotTables, running functions, and more. Purna “Chandoo” Duggirala, Chandoo.org‘s founder, says he has one goal: “to make you awesome at Excel and charting.” He started the blog in 2007 and, today, it contains more than 450 articles and tutorials on using Excel and making better charts. He’s built the blog as a community, citing values like humility, passion, fun, and simplicity. He also works to make it a valuable resource for the folks for whom English is not their first language. Most of his tips stem from forums, where people ask questions about Excel — about formulas, formatting, shortcuts, pivot tables, and so on — and anyone can answer them. Chandoo then uses some of the more helpful forum questions to create articles and tutorials. But it’s not all so formal. 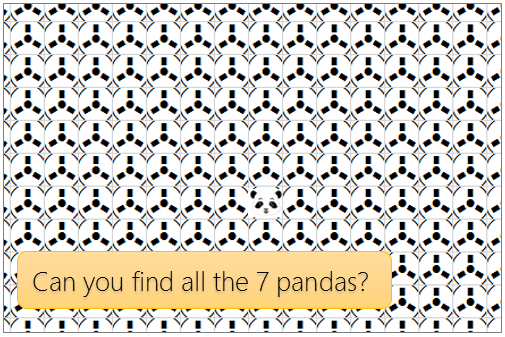 For example, Chandoo once created a digital Easter egg hunt for a blog post, which included a downloadable Excel workbook containing seven hidden pandas. Readers were challenged to locate the pandas using clues, Excel techniques, and even “I-Spy” skills. While the articles, forums, and other parts of the site are free, you can pay to join one of Chandoo’s structured training programs, like Excel School ($97 – $247), or VBA Classes ($97 – $347). Plus, there’s aways the option to buy one of his books — The VLOOKUP Book or Excel Formula Helper Ebook. In each chapter, Excel Easy walks you through what it perceives to be the fundamentals of Excel, in the form of written guides with screenshots to help you master each concept. At the end of the tutorial, you have access too 300 examples showing you how to perform each concept in real scenarios. Concepts include basic formulas and functions, how to create a ribbon, creating multiple worksheets, formatting cells, data validation, table creation, and more. Here’s a resource that puts we mere mortals in touch with Excel experts. MrExcel.com‘s claim to fame is its interactive message board, which is constantly monitored by its community of Excel gurus. The board is organized according to subject, like general announcements, questions, and MrExcel.com products. When a user posts a question, a member of the MrExcel.com expert community will reply with an answer. The questions range from simplifying an Excel task, to solving urgent inquiries. Not a native English speaker? You can ask questions in your native language. Aside from posting questions on the message board, you can also browse Mr. Excel’s “Hot Topics” — found on the left-hand side of its homepage — which includes things like finding the cumulative sum of even or odd rows, or removing the leading zero within a text field. The site also has a library of helpful Excel books and ebooks, and if you need help with problems that are more complex, you can even hire an Excel consultant directly from the website, for a fee. 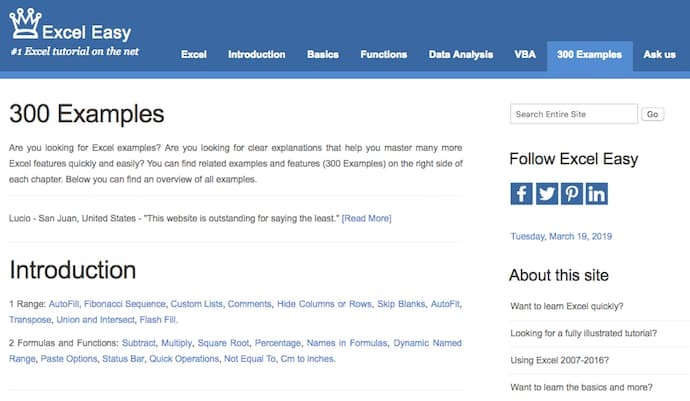 Exceljet offers hundreds of free formula walk-throughs, videos, and blog posts that allow you to itemize your Excel training based on the project you’re working on. It also has several paid programs that take a deeper dive into specific Excel topics its users — of which there are more than 10,000 — are interested in. 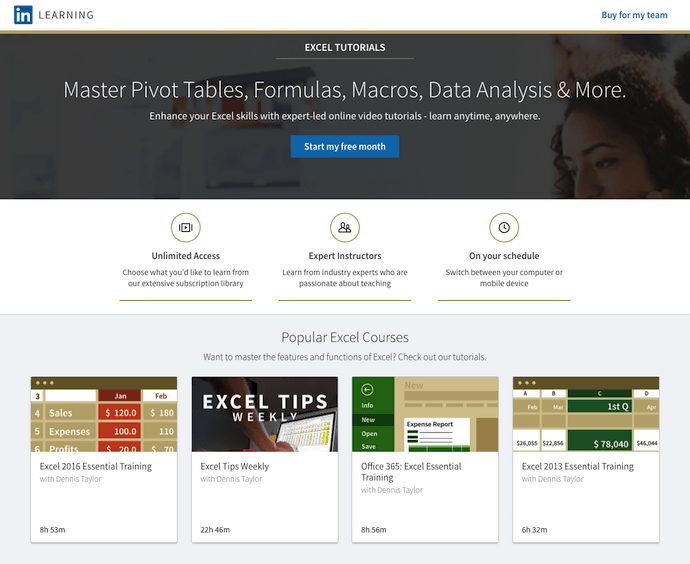 Here’s a budget-friendly option for those in search of a more formal course, rather than a one-off tutorial: EdX is a nonprofit that provides free education for people around the globe — with an interesting model of Excel training sessions, both timed and self-paced. When users enroll in a course that’s marked as “Verified,” they have the option to pay a fee in exchange for an instructor-signed certificate with the institution’s logo, to verify the achievement and increase job prospects. Those fees are used to fund the courses, giving you the option to take them for free if you don’t mind foregoing the certificate. Otherwise, there are some courses offered at a “Professional Education” level, for which the fee isn’t optional. One example is the Business and Data Analysis Skills course, offered for $60. To help you choose the right one, each edX course includes reviews (with a rating up to five stars), and information on length and amount of effort, usually measured in hours per week. There are also details on the level of knowledge required, along with video transcripts. 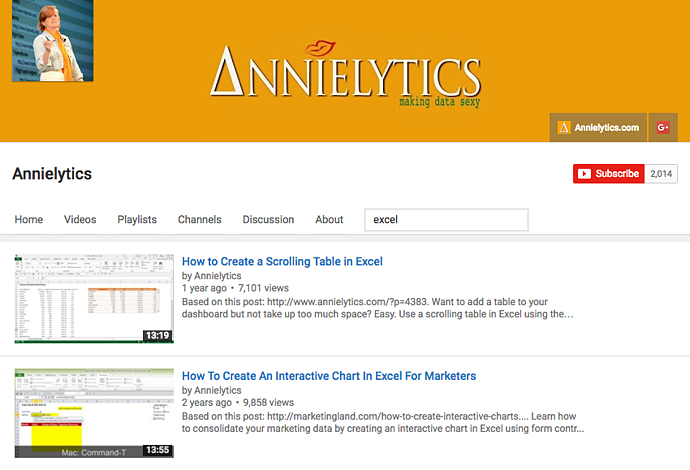 Annie Cushing, a web analytics data expert, created the Annielytics blog and YouTube channel to share her knowledge with the world. Don’t let the punny name fool you — both are chock full of really good, specific, and in-depth web analytics tips. While the content here isn’t all Excel-related — much of it is about Google Analytics, for example — it does contain some great Excel video tutorials. Even better, they were created with marketing and web analytics in mind, so they’re directly applicable to things like marketing data reports. The Excel-specific videos can be found here, or by searching her YouTube channel for “Excel”. When visitors arrive at the Khan Academy website, they’re greeted with two simple but powerful lines of text: “You only have to know one thing: You can learn anything.” And from algebra to astronomy, this resource offers a plethora of free courses on, well, almost anything — for free. That includes a few video tutorials on Excel. Most of them are part of larger, multi-installment courses on broader topics, like statistics. A general search for “Microsoft Excel” yields what might look like limited results, but they actually explain some fundamental parts of using Excel, like distributions and fitting lines to data. If you’re willing to invest a little cash in your Excel training, Lynda’s Excel Training and Tutorials are a worthwhile place to spend it. Members of this LinkedIn subsidiary have access to thousands of courses on business, technology, creative skills, and software that’ll help you work toward your personal and professional goals. While Lynda.com asks for a monthly all-access membership fee, Coursera charges on a course-to-course basis. Partnering with top universities and organizations worldwide, the site offers online classes on a number of topics, ranging from music production to coaching skills. That said, these courses don’t come cheap — after all, they’re the same ones that are taught at top universities around the world. And like many real-world classes, each includes video lectures, interactive quizzes, peer-graded assessments, and the opportunity to connect with fellow students and instructors. Once you finish a course, you’ll receive formal recognition, along with an optional course certificate. If you had six hours to spare, how would you use them? “Sleep,” “clean the house,” and “bake something” are some of the things that come to the top of my mind, but try this on for size — what if you could become an Excel expert in that amount of time? That’s what Udemy promises in its “Microsoft Excel – From Beginner to Expert in 6 Hours” course — for $10.99. Udemy is one of the most bountiful online learning resources out there, and its Excel courses certainly don’t end with that single option. In fact, when I return to the homepage, it displays several additional lessons on the topic, in case I want to explore my options. Those options are many. In fact, just typing “Excel” into the search bar yields dozens of results, each one displaying a star rating, price, length, and level. Price: Free to try | $14.95 mo. Big believers in microlearning, Intellezy’s videos fall in the three- to five-minute range. These nuggets of knowledge are organized into beginner through advanced courses, covering Excel 2007-2016 and Office365. Plus, mobile apps for iOS and Android make it easy to learn on the go. Intellezy’s videos are really engaging. There’s always an instructor on-screen showing you what to do. And because they’re wired for face-to-face interactions, Intellezy’s instructors really hold your attention. Their courses also include assessments and exercise files so you can see how you’re doing and follow along with the instructor. You can give Intellezy a spin with a free 10-day trial. The name of this resource may look intimidating, but you’d be surprised how convenient the training is. Excel Everest is an out-of-the-box resource that teaches you Excel while you’re in Excel. The product you buy downloads an Excel file to your computer, where you’ll open Excel and engage in walk-throughs of 41 different Excel functions right from a sample spreadsheet. Topics covered include conditional formatting, VLOOKUP, chart creation, and so much more. This Excel training resource offers hundreds of exercises, along with video tutorials embedded directly in a sample Excel spreadsheet. By applying these concepts in Excel as you learn them, you’ll feel them stick with you long after you complete Excel Everest’s training. Learn iT! offers Excel training in a variety of formats and breaks every lesson down by module. It’s the best solution for Excel users who might not be receptive to just a video series or written step-by-step guide. 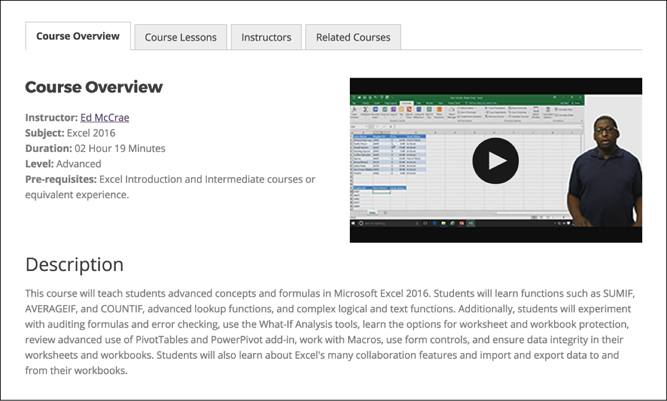 With Learn iT!, Excel users can select from five different courses: Pivot Tables, Intro to Data Analysis, Programming with VBA, Excel Power User, and a basic Excel course for general users. Each course states the course’s duration (in days) and the number of modules the course consists of. The best part about Learn iT! is that you can take your selected course four different ways: an in-person instructor-led session, live online with classmates, privately in a custom-made session, or a self-paced mix of instructor-led and interactive e-learning courses. Price: Free to try | $29.99 mo. LinkedIn isn’t just for professional networking. You can also learn a ton on various business topics with the help of subject matter experts (SMEs) who host trainings on the LinkedIn Learning platform. Microsoft Excel is one such topic. Dennis Taylor, a business consultant you can also learn from on Lynda.com, is one SME who hosts Excel training courses on LinkedIn. His courses range from six hours to 23 hours in total training time, and can be completed on your schedule. 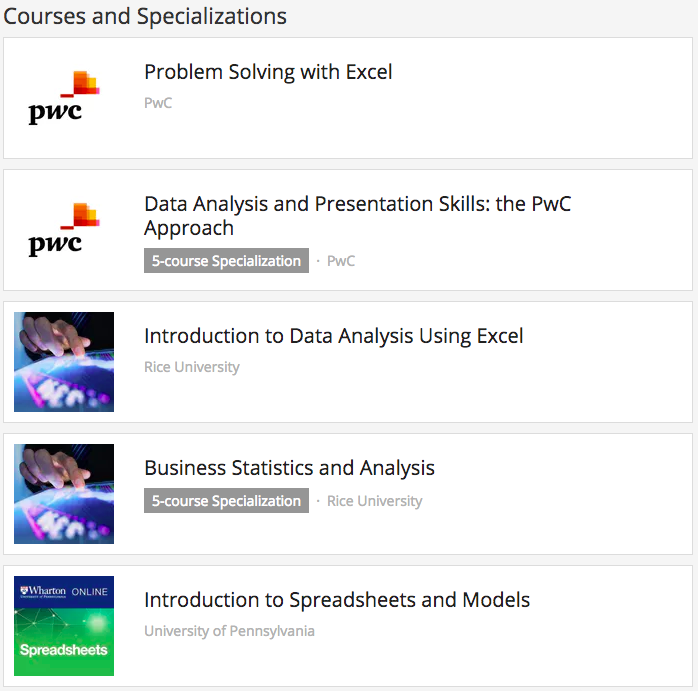 Check out LinkedIn Learning for all available Excel courses. Not only does eLearnExcel give you eight Excel training courses to choose from, but it awards seven Excel certifications as well. 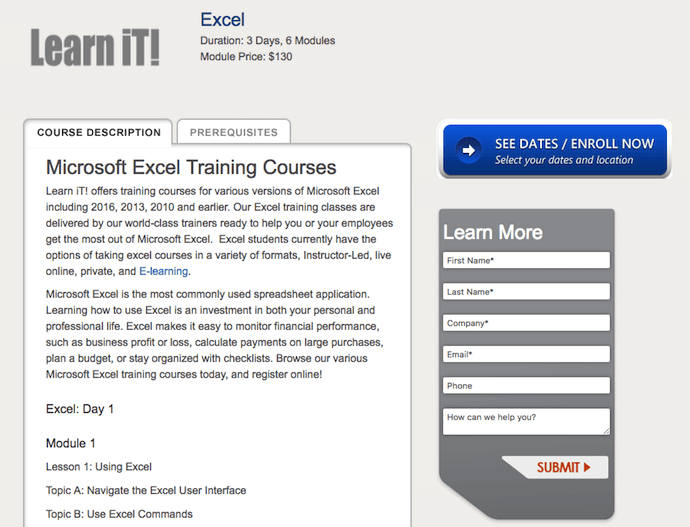 eLearnExcel makes this promise: by taking all of its Excel courses, you’ll have a skill in Excel that’s greater than 99% of Excel users today. Trusted by Microsoft itself, this suite of training products breaks down Excel’s concepts in easy, digestible video modules — allowing you to learn the Excel concepts that are most relevant to you. Courses range from 45 minutes to six hours in duration. Seven of these courses award you a certification that corresponds with the course you took. If you complete all seven, you’re awarded an Excel Master Diploma. It’s not a bad item to put on your resume — or on your business’s website, if multiple employees enroll in eLearnExcel’s courses as part of a business subscription. Ready to get started? With these tools, you’ll be using Excel with little-to-no-sweat, in no time. Plus, practice makes perfect — that’s why there are so many tiered levels of courses available. Start where you can, and as you begin using more functions and commands, you can continue to expand your knowledge. Want more Excel tips? Check out these free Excel templates.